Strengthening Russian-US business contacts will make it easier for the two states to find common ground on the most complicated foreign policy issues, Dmitry Medvedev has said. 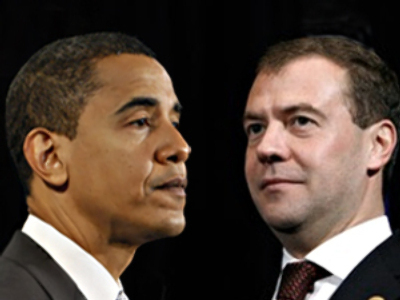 President Medvedev and US President Barack Obama, who is on an official visit to Moscow, have addressed the Russian-American business forum on Tuesday. The Russian leader said he “sincerely hoped for the success of the dialogue” between the two countries. The main focus of the speeches at the Moscow Manege – where top business, government and trade unions representatives gathered – was commercial links between Russia and America. “For Russia, the United States is a long-term promising partner with many plans which have not yet been realized. Despite the cold breath of the previous difficulties and despite the global crisis, the desire of our businessmen to take part in joint projects has not cooled,” Medvedev said. “This is very good,” he added. “America's trade with Russia is only about 1% of all our trade with the world. One percent – a percent that has virtually unchanged since the Cold War,” Obama said. “Surely, we can do better,” he concluded. “We want Russia to be selling us goods and we want Russia to be buying goods from us,” he said. Medvedev, for his part, noted that American companies do have good prospects in Russia. He gave the example of US agricultural machinery maker John Deere, which is now building its plant in Russia’s western city of Kaluga. He also mentioned PepsiCo, the US food and drinks company that earlier announced that it is going to invest one billion dollars to expand its production in Russia. Obama also spoke of a long history of Russian-American ties, recalling that it’s been more than 200 years since the two states set their diplomatic relations. “But before we ever exchanged ambassadors, we exchanged goods. Along the way you gave us a pretty good deal on Alaska. Thank you,” he added. The audience appreciated the joke and met it with laughter and applause.